For the most part, I have every intention of writing informative and helpful posts. Most posts should help to start conversations, offer validation and create empathy, but living with bipolar, plans sometimes change. Periodically, I will also be writing posts for me. These are posts that you, as the reader, might not enjoy. That’s okay. You are welcome to skip this post. These posts will be about me coping with my illnesses and all the fun (I use the word loosely) that life creates as a result. This is one of those posts. You have been warned. In addition to living with bipolar, one of the conditions I cope with on a daily basis is Familial Mediterranean Fever (FMF). Through a Facebook group I follow, I have heard wonderful stories about patients who take colchicine, the primary medication prescribed for FMF, and how they live full and relatively symptom-free lives. And then there are others of us, myself included, that receive little to no benefit from colchicine. Most days I am able to stay positive. The amount of stomach pain is so much less on colchicine than it was before I started taking it. I can be grateful for that usually. But the attacks continue. I run a fever most days. Pain is always a companion to the fever. Sometimes that pain pushes me over the edge. At least a little. There’s a reason why pain is used in torture. Nothing rattles your mind more than constant pain, especially the type of pain the keeps you from sleeping. FMF works hard at torturing me. 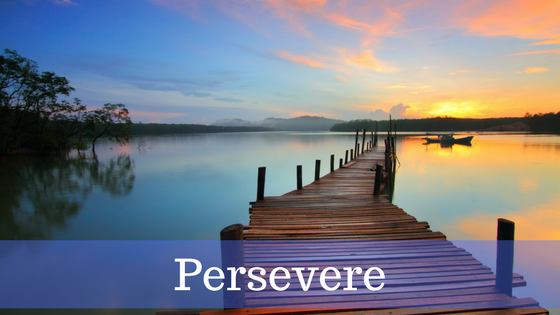 But I persist. 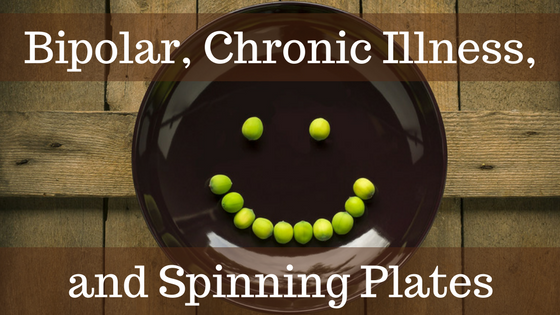 So what do spinning plates have to do with living with bipolar or chronic illness? They are a perfect word picture. 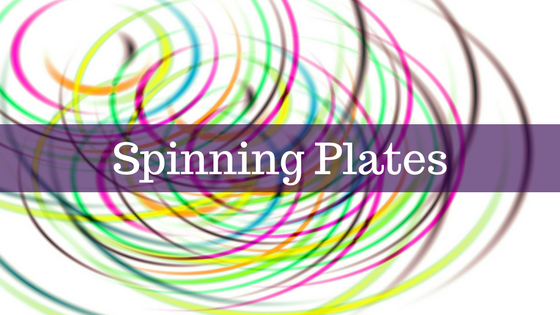 Ironically, I could not easily find a picture of spinning plates. Everyone has seen a plate spinning. If by some small chance you haven’t, I’ll wait while you go Google a video to check it out. Go on. My life feels like an unending game of plate spinning. In January I left a very stressful job to work from home. I love working from home. I mean I really, really love working from home. Wish I had made the change years ago. It seems to work better for me to take freelance gigs without time constraints so I can work on my schedule. The wonderful thing about this type of work is that if I need to go to bed for a while in the middle of the day, I can do that. The work will wait until I’m ready to work on it again. But in my desire to make sure I have enough work, I have signed up with several freelance companies. At the same time, I started this blog and have committed to a few writing projects. Having so many options for work means that I am frequently bouncing from job to job. Typically I’ll work for 2-3 companies in the course of a day. Sometimes more. In fact, one job forces me to multitask because I can only do part of the job and then have to wait at least an hour before I can finish it. The hard part is remembering to go back to it. Hence the spinning plates. In addition to work, there’s a house to keep clean, laundry to do, food shopping and cooking, and now that it’s warming up (it is going to warm up this year, isn’t it? ), I also have a yard to think about. I love being in the yard and the flower beds. But that means there are other plates spinning, or crashing, while I’m enjoying myself outside. It’s a struggle to keep them all spinning. Everything in life is about balance. 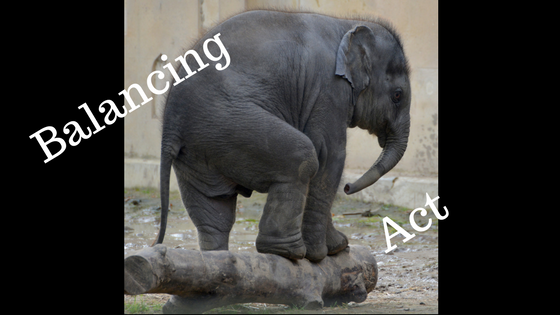 Balance is especially vital when you are living with bipolar or chronic illness. That is my struggle right now. I chose the above picture because that’s how I feel. Good luck, little fella. Finding the right balance for all the projects and responsibilities I have taken on is still very much a work in progress. The bipolar brain, or at least my bipolar brain, has two settings. One, I can do everything for everyone. I don’t need to eat or sleep. Saying, “No” is not an option. And, two? I can’t do anything. Taking a shower requires too much effort. Getting dressed is too hard. I am too stupid or unreliable to be of any help to anyone. No one really wants to spend time with me, so why should I spend time with them? Let’s stay in bed all day, only getting up to go get a dozen Krispy Kremes, and then eat all 12. And then hating myself for the next week. Happily, my brain does not go into the latter mode often. Most days I am on a sliding scale somewhere between one and two. But mania always comes with a price. The longer the manic episode, the higher and more painful the price. That means that even when I find myself slipping into mania, I have to push myself to slow down and try to keep some semblance of balance. There are enough plates spinning. I don’t need to add more. It’s okay to say no. Guilt is inevitable, but it is okay. I know guilt won’t kill me. Plates may fall. Some may break. Some may never spin again. But tomorrow is still a new day. So tonight I throw myself a little pity party. I whine to myself about the physical pain that limits me and the emotional pain that makes me irritable and unstable. I beat myself up for the doughnuts, but at least they are gone, so I can’t eat anymore. Tomorrow the sun will come up. I will smile and carry on. If I can keep just one plate spinning, well, then I have accomplished something. Something worthwhile. Please share this post about living with bipolar on Pinterest or on other social media. Thank you in advance! Nice blog and your posts are well written. Thank you for following BrewNSpew. That’s a great quote. Thank you for commenting. I really enjoyed visiting your site. Love the plate analogy. Have you read about the Spoon Theory? I have, yes. 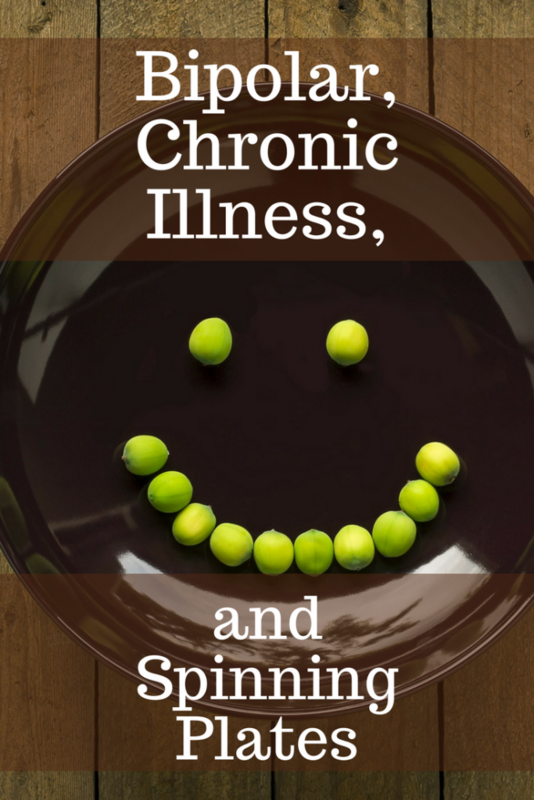 In fact, I refer to in in my post about chronic illness. Thanks for taking the time to comment!